Like most of us I’ve been disturbed by the boat tragedies off the coast of Christmas Island. I sometimes describe myself as an “economic refugee” since my family’s postcolonial transit from Kenya to the UK and thence Sydney was in many ways bumpy so the extent and suffering of displaced peoples troubles me. At the end of the month I plan to travel to Medan to spend a week with the Jesuit Refugee Service and to visit the international detention centre in Bedawan as well as community- based refugees. Australia has been slow at processing its quota of UNHCR refugees most of whom remain stranded indefinitely in Indonesia, their children not having access to acceptable education or adequate health. Julian Burnside’s article on “Law and Justice” published in Meanjin in 2007 argues in favour of a human rights legislation to remedy the existing deficiencies. What are some of the theoretical and creative constructs implied by the ideologies of political membership and sovereign decisions? The existential conditions of waiting, postponement, alienation and exclusion that characterise territorial passage are strongly evoked in Franz Kafka’s fiction. His allegory “Before the Law” describes how a man from the country arrives at the gate of a hall, hoping for admittance. Beyond the barrier guarded by a doorkeeper there are even more formidable barriers and though the man waits for years, entry is not granted. Yet the door, according to the doorkeeper, has been constructed solely for purpose of the man in limbo. Likewise, in Kafka’s unfinished masterpiece, The Castle, there are many appointments and bureaucratic processes for the land surveyor K to outmanoeuvre in order to gain residence in the village and permission to visit the Castle. So for both Kant and Arendt there is a tension between cosmopolitan rights and sovereign privilege. The universal moral principles are circumscribed politically and juridically so that an act of inclusion contains its own terms of exclusion. But this becomes complicated by globalisation with its economic, military, social and communicational interdependence, its cross-border mobility. The nation state seems at odds with how the technologies of globalisation appeal to newly-imagined forms of democratic representation. A few weeks ago while I was wondering what to write about for the Southerly blog a lecture was given by Professor Ranjana Khanna, on Affect, Touch and Unbelonging. Her beautifully developed thesis describes affect as a mode of unbelonging which does not desire to belong but which seeks refuge in a form of unbelonging. I think I only absorbed about ten percent of this gracefully dense exegesis but it was a suggestive and important flow of thought which I’ve enjoyed reading more about. The discourse of asylum as a spectral interface seems palliative while people are risking their lives in overcrowded boats. The ambivalence of asylum both conceptually and politically is sustained by the risk of porosity it poses, by its ethics of difference and alterity. This paradox returns us to the question of territorialisation and inalienable rights. 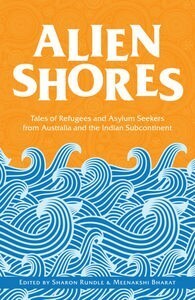 It’s timely that a new collection Alien Shores edited by Sharon Rundle and Meenakshi Bharat has recently been released. This anthology by Indian and Australian writers reflects cogently and variously on the narratives of migration and indeterminacy but it also reimagines a more democratic representation of justice. Sophie Masson’s rhizomatic fable, “Once Upon A Stranger’s City” opens the collection to the possibility of unconditional hospitality for the family of newcomers in ‘the city of strangers.’ In Linda Jaivin’s “Karim” the knotty challenge of hospitality enters the domestic scene as the narrator is appalled to learn that her daughter Sonia has adopted a detainee. Ironically Karim becomes a chef and cooks his host rather sumptuous meals. Jaivin’s humorous evocation of urban contemporary life in the wake of an illegal newcomer has an uplifting conclusion rendering the refugee as economically independent and capable of making decisions. But many of the stories are less optimistic. Some authors, such as Amitav Ghosh in “Morichjhāpi” and Tabish Khair in “A State of Niceness” chose somewhat unresolved narratives. There’s a sense of complexity and enigma in Ghosh’s embedded retrospective, in which a writer’s diary of engagement with a refugee community is posthumously examined by his more politically conservative spouse. The device of the diary emphasises the significance of archive. Yet at the same time the impossibility of historical memory to determine truth is reminiscent of Derrida’s notion that under testimony the present cannot substitute the past. The crossed allegiance and unreliability of what Spivak describes as the ‘native informant’ manifests in the character of the lunatic who claims to be a Hindu yet marches with a caravan of Muslims in Joginder Paul’s soul-wrenching tale of partition “Dera Baba Nanak.” Tabish Khair’s character, Syed, beautifully observes and internalises the complex psychological disturbance of diaspora, its liminality, while Susanne Gervay’s “Remembering Timor Leste” recounts perceptions of loss, fear, estrangement from the too-often unvoiced perspective of a child refugee. The social exchanges and interactions that intruders encounter are touched upon variously in Alien Shores. Interlocutors appear in many of the stories: the inspector and government agents who remove the alien arrival in Anu Kumar’s “Big Fish”, the narrator who becomes a translator for a refugee under Temporary Protection in Ali Alizadeh’s comic piece “The Ogre”, the narrator of Linda Jaivin’s “Karim” who escorts him through the formalities of registrations and enrolments. One of the most powerful stories for me is Abdul Karim’s “Life Hanging In the Balance.” The narrative style is strong and direct; the story traces the bitter irony of anticipation as Musa, a Hazara refugee, awaits his application for a permanent visa, but when the letter from the Immigration Department finally arrives he is unable to read it. The entire plot hinges on Musa waiting for his friend Halim to read out the letter, which turns out to be a rejection. It’s a brilliant, Kafkaesque portrayal of vulnerability before the law, focusing on a seemingly ordinary day with its indifferent reckoning. For over a decade Australian stories about displacement and asylum have interpreted and purposefully complicated political and legal discourses on refugees. I think of Eva Sallis’ The Marsh Birds, Nam Le’s The Boat, as well as less known publications: Lives in limbo: voices of refugees under temporary protection Ed by Michael Leach and Fethi Mansouri, or the anthology, Fear Factor: Terror Incognito also edited by Sharon Rundle and Meenakshi Bharat. In 2004 David Brooks and Noel Rowe edited a memorable issue of Southerly on the theme of Asylum, featuring stories, essays and poems by refugees in detention. Alien Shores is a significant contribution to this body of literature. Its South Asian and Australian voices make it unique in this genre. It emphasises the divide between justice and the law, reception and exclusion but it also offers us a gift of liminality, of different narrations and new configurations of hospitality. There is a risk of thinking that asylum is remote and external, a territory excised from ourselves. For me it is much closer than that and I hope to gain more insights and deepen my understanding of the many discourses in which asylum is constructed and may be breached, wave after wave. Thank you for such depth and detail in this sensitive and erudite review of ‘Alien Shores’. The stories are remarkable for their diversity, belying the myth of the homogenous refugee. The stories are, as mentioned, complex, enigmatic, comic, Marxist, Kafkaesque, even brilliant. This collection is indeed unique and I have to admit I am very proud of it and am indebted to our contributing authors for sharing their stories. Thank you Sharon. It was a pleasure writing about Alien Shores: I hope many more readers will enjoy the stories in your anthology.